This set is absolute cuteness - I love it! I just got some new sets in the mail from I heart papers - Kate is quick on shipping (and I love that she doesn't charge extra for Alaska). 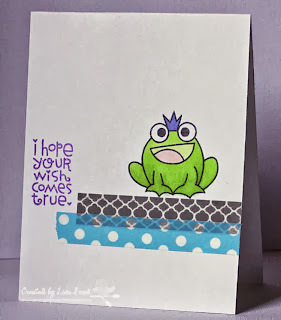 My card is for the Paper Smooches Sparks color challenge this week on the blog. I generally have a hard time with color challenges, but this one came together quick - I love one layer cards. I got some new washi tape and found the perfect colors to go along with the challenge. Definitely love the new sets coming out recently! Now I need to purge my paper..... We are moving in December and that is one of the heaviest things! Love!! I love how you colored the frog and the way you used the colors are perfect! Thanks for joining us at PS Sparks Challenge! I agree- the new stamps are SUPER cute! And you've used this set perfectly! LOVE that little frog:) What a fab take on these colors! THANKS so much for joining in the fun and playing along with us over that Paper Smooches SPARKS challenge!